“A Friend to be Found” was an interactive and individualized Nocturne-wide manhunt supported by instant photo production and social media. Participants were initially faced with a wall of blocked out windows on the exterior of the Printing House, except for a single opening with a camera lens facing out. Surrounding the lens-hole was a disclaimer announcing that by looking in the opening, the participant’s photograph would be taken, printed and handed out to another participant, whom they may or may not know, at a yet-to-be-determined time during Nocturne. The printouts were formatted in an easy to handle, 3” x 6” size and included a description of the purpose of the photograph along with the social media hashtag “#friendfoundnocturne”. With the assistance of Printing House staff, the printouts were compiled periodically throughout the night and distributed from the main entrance of the building to event attendees walking past. The participants who were given the printed cards of other participant’s faces were then presented with the challenge of finding the person whose card they now possessed. Should they come across the photographed participant, they could share the experience of meeting a new “friend” on social media using the hashtag. In total, a little more than 400 participant’s photos were taken and distributed. Five, connections were made at the point of distribution wherein the participants could identify the person in the photograph as being a friend, neighbour or classmate. And three connections were made over asocial-media following the event. Échapper, in French means: to escape. In cycling, it refers to a break away or to leave the bunch behind. The drive professional cyclists have to push themselves beyond their limit is a mix of inspirational, psychotic and enigmatic, especially to those foreign to the sport. Where does the “drive” come from? What motivates an athlete to push harder after pushing for hours. Use cycling as a recognizable catalyst to explore the motive of winning, this installation asked participants to participate in a physically challenging race, when the finish was unknown. 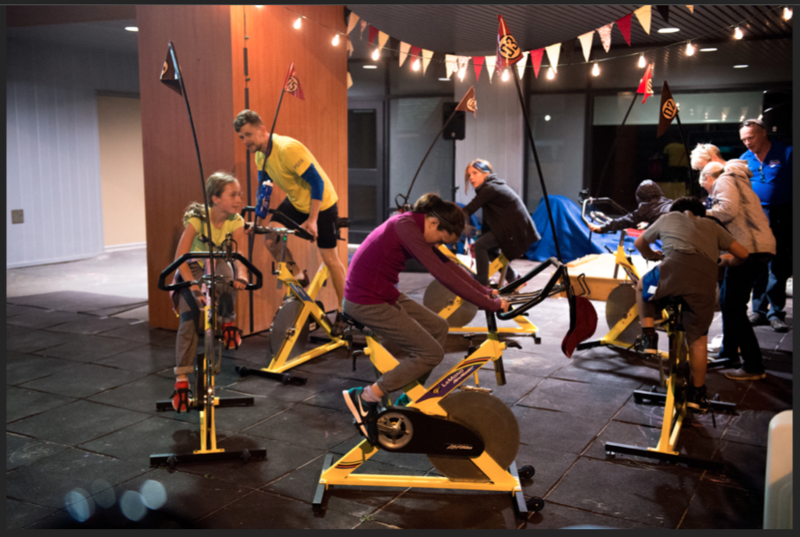 While participants pedaled away, through a combination of sound, installation and a live emcee performance they were be playfully encouraged to attempt to best their opponents. As the race progressed, the audio commentary, performance of the emcee and inevitable audience cheering further pushed the participants to compete harder. However, as the encouragement continued, without fail, participants soon become aware that there was no finish and no declared winner. The impetus to win was entirely internal. Participants came and went throughout the night, but the race continued on. After noticing a small fenced in area at the East end of the Halifax Commons (the Cornwallis Street Gateway) had been erected with no clear purpose, besides holding an innocent garden hose, I was inspired to create a small sign to engage the space. This series of portraits explores Canada’s real and imagined past of immigrants and travellers who have ridden the train at Pier 21 in Halifax, Nova Scotia. The composite characters explore both the different waves of immigrants who landed at Pier 21 but soon left for other parts of Canada as well as those Canadians who were leaving for other parts of the world. 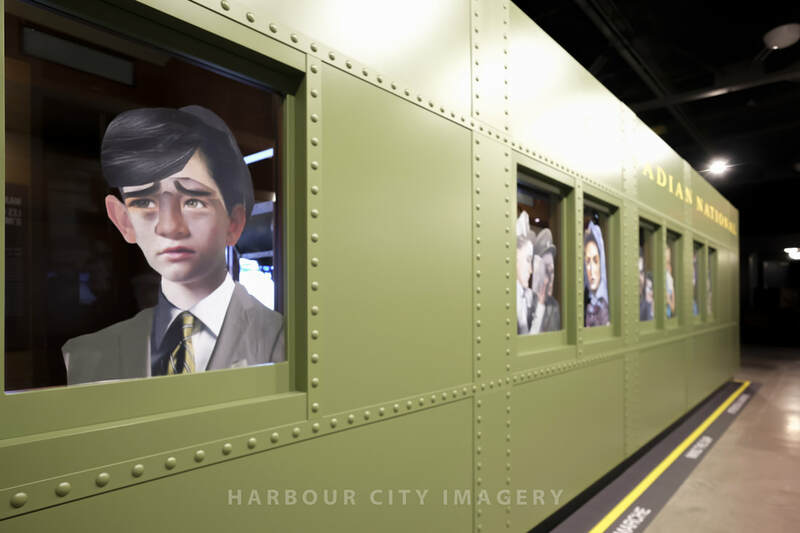 The portraits were installed onto the windows of the mock Colonist Car at Pier 21: Museum of Immigration during Nocturne: Art at Night 2017.